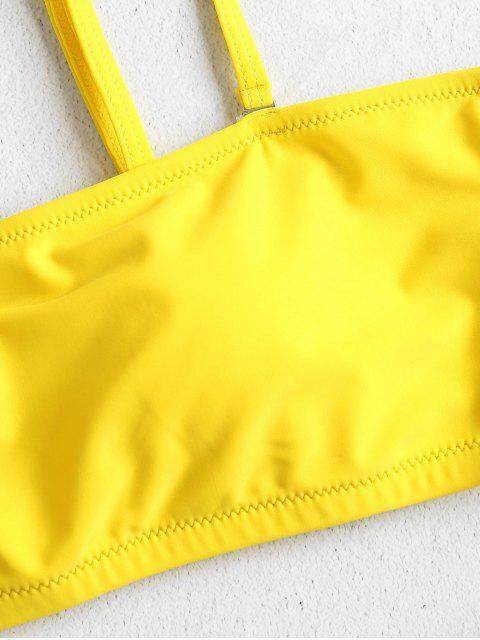 [24% OFF] 2019 High Cut Tube Bikini In YELLOW | ZAFUL .. So cute I feel like a Barbie! This bikini will make any tan pop, it’s SUPER bright and unique!!! Only thing is I ordered a S, but it looks like a M. I’m petite, so the bottoms are big around my waist and scrunch up oddly at the back. At least it’s family-friendly with great coverage! Super cute & FAMILY APPROPRIATE!!! 5’1” 115lbs got a small. Feel like a Barbie & love the color. True to size, Looks exaclty like the pictures, & Comfortable and of fantastic material!! Ready to pair with your stunning sunnies and breezy cover-ups for a sassy beach style, this solid bikini set features a bandeau top with removable slender shoulder straps and a pair of high cut briefs to complete the look. Available in two bright colors, and you won't regret getting this figure-flattering bathing suit!